Level measurement is an important part of process control and is used in a wide variety of industries. Continuous level sensors are used to measure the level within a specific range and provide continuous monitoring of level conditions. Magnetostrictive Level Transmitters (MLT) are used extensively around the world to accurately measure level in process vessels. High accuracy and no maintenance are two of the most common reasons for choosing this technology. With ratings to 800ºF / 427ºC and 3000 psig / 207 bar, MLT's are suitable for almost any application. The MLT versatility allow direct in-tank installations or attached to a magnetic level gauge. HART, Foundation Fieldbus and Honeywell DE protocol options make the MLT's easy to connect digitally to most control systems. HART or Fieldbus protocol & an accuracy of +/- 0.01% FS. displacers, ultrasonic meters and radar transmitters. The 100S Magnetostrictive Transmitter is based on the Same Magnetostrictive Principle as the 100 Model. The 100S is a High Accuracy Sanitary Magnetostrictive Liquid Level Transmitter Suitable for CIP and SIP Applications. Unlike conventional through-air radar (also known as FMCW – Frequency Modulated Continuous Wave), Guided Waves Radar utilizes a wave-guide to direct or guide very low power microwave pulses. FMCW radar sensors emit higher frequency microwave pulses through-air to reflect from the product surface. Guided Waves Radar directs a pulse down a probe that is reflected at the material to be measured. Transit time is measured and level calculated. Use of a probe or wave-guide permits very efficient energy transmission, use of compact, low power electronics resulting in higher efficiency and lower costs. The 700 series uses guided wave radar to make measurements, which means no moving parts and therefore, virtually no maintenance. A waveguide directs the microwave pulses, eliminating the beam divergence problems common to conventional non -contact radar transmitters. 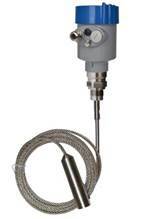 Model 701 with a stainless steel cable probe is designed specifically for bulk solids in Silos. A hermetically sealed float with an internal magnetic ring is housed in a non-magnetic float chamber. The float will move up and down in the chamber as the level rises or falls in the vessel on which it is attached. A magnetic, highly visible "shuttle" or Bar graph indicator encapsulated in a hermetically sealed glass tube, is attached in a scale housing to the outside of the float chamber. It indicates the liquid or interface level without being in contact with the process fluid. Model 26 Magnetic Level Gauge has proven (more than 100 000 installed internationally) itself safe for total and interface applications that are toxic, corrosive, flammable, or high-pressure and is easy to maintain with no sight glasses to clean, superior in design, operability, long-term safety and cost of ownership For accurate measurement of liquids such as oil, water, acids, solvents, petrochemicals or most liquid-to-liquid interfaces across a variety of industries, The product range includes the standard model 26 magnetic level gauge (MLG) with a chamber of virtually any non-magnetic material, extruded process connections, a custom engineered float and all accessories with 316 stainless steel construction. standard 1-1/2 inch chamber provides the measurement capabilities of coaxial style probes without the potential for fouling due to buildup. The separate float chamber allows the float to travel unobstructed throughout the range of measurement. Redundant level control can be achieved by adding a magnetostrictive transmitter or switches to the float chamber. One of the oldest and most common methods of measuring liquid level is to measure the pressure exerted by a column (or head) of liquid in the vessel. We offer solutions with submersible sensors and through the tank wall sensor options. Plumb Bob Device - for difficult level measurements in Silos. 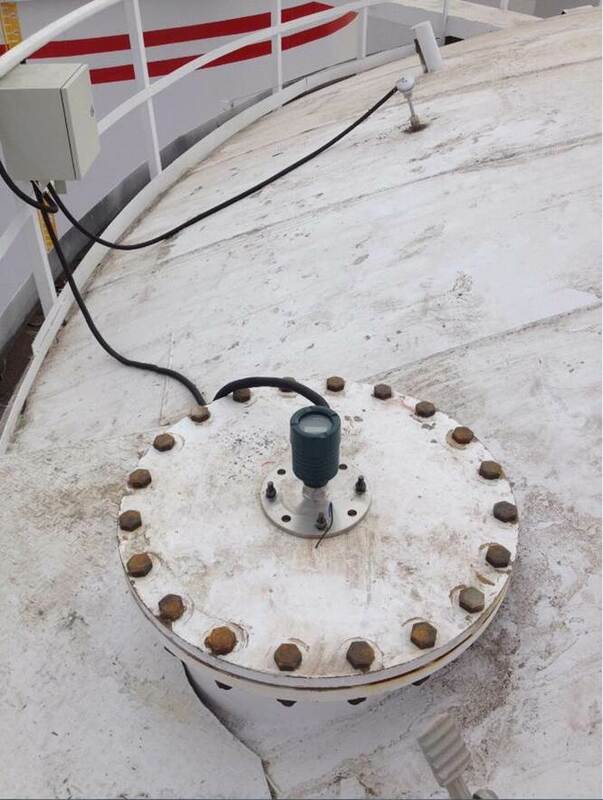 The Plumb Bob Device is Used for "On-Demand" Level Measurement in Silos and Vessels. Even Precise Volumetric Measurements and Long Measuring Distances are no Problem. The Model SLT is an Electro-Mechanic Level Measuring Instrument for the Continuous Measuring of Level in Hoppers, Silos or Tanks. This Top Mounted System is used for Monitoring the Level in Applications, such as Powders, Small Grain Bulk Materials or Coarse Grain Bulk Materials. A Bob Weight is Mounted at the End of a Measuring Rope or Tape, which is Wrapped on a Motor Driven Rope Roller. Upon Contact with the Bulk Material, the Bob Weight Returns and is Drawn Back to its Upper Stop Position. All Digital Designs that Combine Accuracy and Speed for Non-Contact, Continuous Level Measurement. Applications Include: Pellets (Converters), Slurries, Opaque Liquids and tall Bin and Silos. Model 80 Laser is a High Performance Laser Transmitter that can Accurately Measure Level, Distance and Position Over Long Ranges in Extreme Environments. Model 80 Features Advanced Timing and Sophisticated Signal Processing for Pinpoint Accuracy at up to 30m / 100ft. (Level Applications) and to 150m / 500 ft. (Positioning Applications). Ultrasonic sensors provide a cost effective sensing method with unique properties not possessed by other sensing technologies. By using a wide variety of ultrasonic transducers and several different frequency ranges, an ultrasonic sensor can be designed to solve many application problems that are cost prohibitive or simply cannot be solved by other sensors. Ultrasonic sensors continuously emit high frequency sound pulses inaudible to the human ear which travel away from the sensor, hit the surface of the target and are reflected back to the sensor. The sensor electronics measure the time taken by the signals to return after being reflected by the target surface. Since the speed of sound is affected by air temperature, our ultrasonic sensors include a built-in temperature sensor. Level/distance measurements are automatically temperature compensated throughout the operating temperature range of the sensor. Sigma has a variety of sensors available to satisfy the requirements of most applications including Micro, a compact, ultrasonic level transmitter/switch that features Variable GAP technology that allows the instrument to work even in the presence of dust, vapour or foam. Variable GAP ensures accurate measurements by always working with the smallest return signal. The gain is automatically increased if the return echo is being absorbed by dust or foam in the environment. Variable GAP technology also provides the narrowest beam angle in the industry, at less than four degrees. 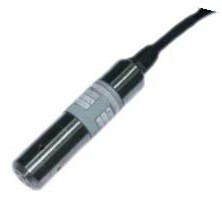 This allows the transmitter to make accurate measurements in narrow vessels. This transmitter measures liquid levels to 10m and bulk solids to 5m.